We know ﬁrst impressions are everything; that’s why we supply and install a wide array of doors to create the perfect entry for your home, building, apartment or oﬃce. Need doors for inside? We supply and install interior doors to add privacy and security to any room. We don’t just stop at doors we also supply and install all door related hardware. New door closer because of a slamming door, new hinges to ensure proper hanging, new panic exit device, for egress in times of an emergency or new locks and trims for an updated look, we do it all! Our services are guaranteed to be up to all building codes and are FDNY compliant. We are knowledgeable about building codes for removal of any existing building violations. Our customers have complete freedom to choose and customize doors that best suit their security needs and aesthetic sense. 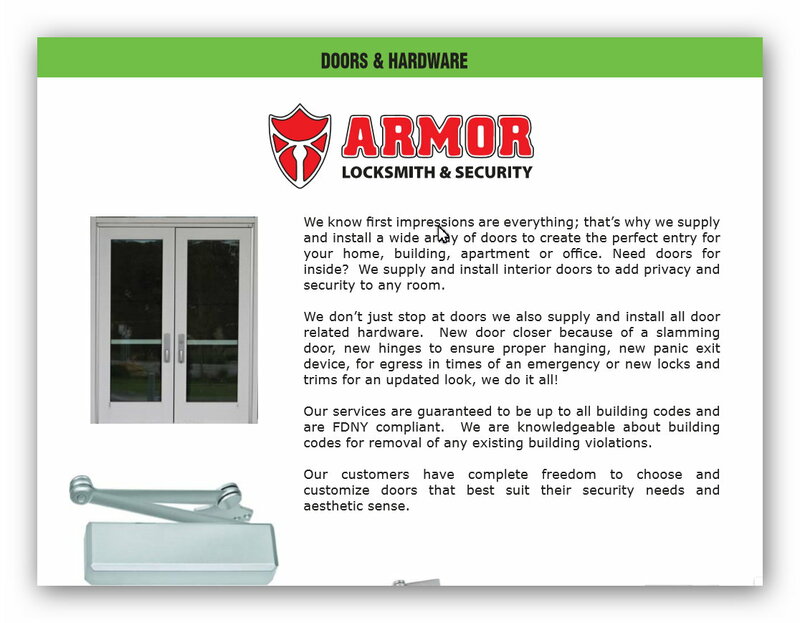 If you need doors & hardware just call us now Armor Locksmith & Security (718) 445-9200 Armor Locksmith & Security.